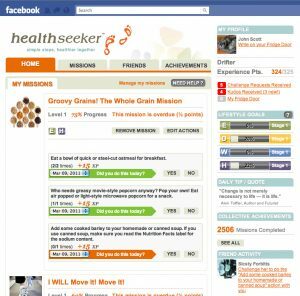 Healthseeker is the world’s first-of-its-kind game on Facebook®. Developed by Ayogo in collaboration with the Diabetes Hands Foundation (DHF) and the Joslin Diabetes Centre (Harvard Medical School) and funded by Boehringer Ingelheim Pharmaceuticals Inc. (BIPI). Healthseeker was designed to motivate better lifestyle choices by people living with diabetes and engage them in improving both their nutritional and physical health. 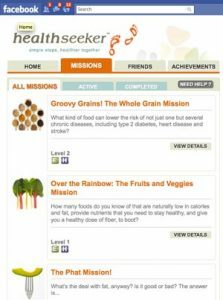 By using a game design approach that will be familiar to players of popular casual social games, Healthseeker uses achievements, virtual prizes, and gifting to create instant rewards for healthy behavior, bridging the gap between intentions and action. As action steps are completed in real-life and players return to report their progress, they receive experience points and other instant awards for their achievements. Badges and experience points accumulate over time and help the player advance to different levels. Special virtual “pats-on-the-back” called kudos can also be collected, but can only be given away to other players as a show of support. Players can also record their progress and thoughts about their day on their Fridge Door, a wall that displays supportive and inspirational messages from anyone playing the game. The game utilizes the player’s own social graph and uses their friends as sources of inspiration and support as they push beyond intention to live their actions. There are GOALS, MISSIONS, and simple ACTION STEPS that a player completes in order to help them get started on the road to better health. The first step is to review a list of GOALS the game provides and identify the ones they would like to achieve by playing. Then, they choose from a list of possible MISSIONS that are designed to help complete their goals. Once they select a mission that looks challenging as well as fun, they must choose three specific, but simple ACTION STEPS from a menu to complete the mission. The action steps are activities players can do on their own or with family and/or friends. These activities can also be easily incorporated into everyday life. As a player completes action steps and returns to the game to report their achievements, they receive experience points. Each mission has 4-5 levels. The game becomes more ambitious as a player completes each level. Players are rewarded for their achievements with points that can be used to obtain badges or trophies, and by receiving kudos from their friends. Healthseeker also uses a variety of social media tools to help players and their friends keep each other motivated en engaged. Players can challenge each other to complete a mission (for which both receive extra points), give kudos for achievements, and invite others to join them. Effectiveness can be measured by the average number of healthy actions taken in the game, the difference between players who are active users, active social users, and the impact of play styles on player behaviour in the real world related to diet and exercise. Since the game launched in June 2010, it has quickly become a viral phenomenon among the online diabetes community with approximately 7,200 players who have completed over 32,900 healthy actions and eaten more than 15,900 healthy meals. We’ve also found that players who receive encouragement from their friends in the game have, on average, 2.5x as many healthy actions as players who don’t—this is the power of social connections. Healthseeker engages people in their own health by motivating small actions with small rewards. We designed those rewards to leverage what we understand about how our brains work: small amounts of motivation to spur small actions in small periods of time for small (virtual) rewards. Making those instant gratification rewards something that you can use—to reward the healthy behaviour of other players. Our premise is that these two compulsion loops, one of pattern completion, and one of reciprocal social obligation, would reinforce each other and make our game more effective in producing action. An interesting example of how “social challenge invitations” motivate behaviour, even when they weren’t accepted, emerged during game play. When a player chooses a mission, they have the opportunity to challenge a friend to do the mission with them. We included this feature in the game because we believed it would be more motivating for a player if they could involve a friend in the challenge with them. What we hadn’t expected to see was that people who received a challenge became highly motivated to complete missions. In Healthseeker, the average player had done six healthy missions after the first two months of playing. A player who has sent at least one challenge to a friend has done an average of 12 missions – almost twice as many. But players, who have received a challenge, even if they haven’t acknowledged the challenge, have done on average, three times as many healthy missions; and people who have accepted these challenges have completed slightly more missions. So we found that receiving acknowledgement from another player that they care about your health enough to include you in their mission was highly motivating to healthy behavior and increased people engagement in achieving their goals.